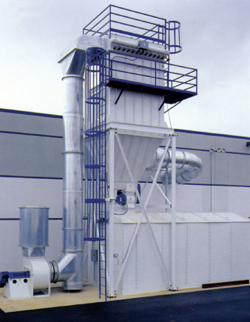 The FTD series of top door pulse jet filter is the first choice of larger operations. The top door service of filter media allows complete maintenance to be performed from the exterior of the filter. The unit is also constructed with a full walk in plenum for areas of inclement weather or round the clock operation. Applications include, saw dust, agricultural products, chemicals, and rock crushing.